The Dutch newspaper “Parool” features a comic called “Mutts“. It’s one of those comics which do not make you laugh out loud, but make you think and eventually smile. Mooch was probably collecting shells, lot’s of them, without his knowledge. Look at the beautiful pictures from the book A Grain of Sand by Gary Greenberg. I see shells there! The tip of a spiral shell has broken off and become a grain of sand. It is opalescent from the repeated tumbling action of the surf. 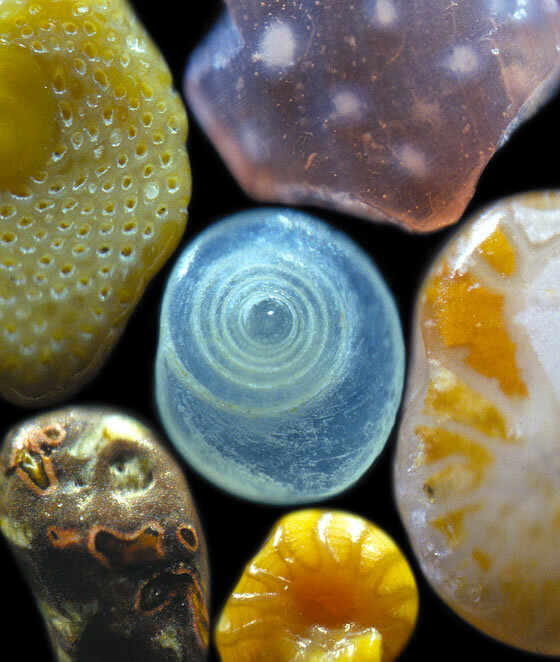 Surrounding the shell fragment are five other sand grains, from top middle clockwise, (1) a pink shell fragment, (2) a foram, (3) a microscopic shell, (4) a volcanic melt, and (5) a bit of coral. Image Copyright © 2008 Dr. Gary Greenberg, All Rights Reserved. Recent comments in the Parool showed that there are at least a few people who dislike the Mutts-cartoon. Perhaps sometimes the translation from English to Dutch may not work very good, generally it’s fine and I think those people don’t have a clue what they’re talking about!